Why make the rounds searching for rubber compounds when they're all right here in one convenient place? All Seals has developed nearly 500 different rubber compounds, in a variety of materials and hardnesses to satisfy virtually every conceivable requirement. And if your application requires unique properties and/or capabilities, we'll develop a compound for you! 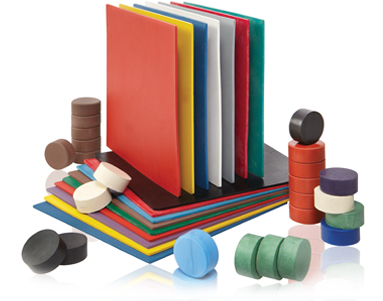 The tables below describe our most commonly specified rubber compounds, as well as an overview of some of our specialty rubber materials. The information presented here is necessarily general in nature and abbreviated in scope. For more specific information or expert advice, please contact us and speak directly to an experienced compound professional. Viton™ ETP (duPont) Viton "Extreme"
*A wide assortment of certified compounds are available. UL and NSF Certified compounds are manufactured by RT Dygert. Please contact All Seals for more information regarding UL and NSF Certified compounds. Where there’s a need for quality rubber parts, All Seals is your premier source. All Seals has a vast inventory of standard parts in universally specified materials readily in stock! Rely on All Seals for the widest selection of machined plastics.